Hematite, also spelled as haematite, is the mineral form of iron(III) oxide (Fe2O3), one of several iron oxides. It is the oldest known iron oxide mineral that has ever formed on Earth, and is widespread in rocks and soils. Hematite crystallizes in the rhombohedral lattice system, and it has the same crystal structure as ilmenite and corundum. Hematite and ilmenite form a complete solid solution at temperatures above 950 °C (1,740 °F). In mineralogy, a pseudomorph is a mineral or mineral compound that appears in an atypical form, resulting from a substitution process in which the appearance and dimensions remain constant, but the original mineral is replaced by another. The name literally means "false form". Banded iron formations are distinctive units of sedimentary rock that are almost always of Precambrian age. The name hematite is derived from the Greek word for blood αἷμα haima, due to the red coloration found in some varieties of hematite  . The color of hematite lends itself to use as a pigment. The English name of the stone is derived from Middle French: Hématite Pierre, which was imported from Latin: Lapis Hæmatites around the 15th century, which originated from Ancient Greek: αἱματίτης λίθος (haimatitēs lithos, "blood-red stone"). The magnetic structure of a-hematite was the subject of considerable discussion and debate in the 1950s because it appeared to be ferromagnetic with a Curie temperature of around 1000 K, but with an extremely tiny magnetic moment (0.002 µB). Adding to the surprise was a transition with a decrease in temperature at around 260 K to a phase with no net magnetic moment. It was shown that the system is essentially antiferromagnetic, but that the low symmetry of the cation sites allows spin–orbit coupling to cause canting of the moments when they are in the plane perpendicular to the c axis. The disappearance of the moment with a decrease in temperature at 260 K is caused by a change in the anisotropy which causes the moments to align along the c axis. In this configuration, spin canting does not reduce the energy. The magnetic properties of bulk hematite differ from their nanoscale counterparts. For example, the Morin transition temperature of hematite decreases with a decrease in the particle size. The suppression of this transition has also been observed in some of the hematite nanoparticles, and the presence of impurities, water molecules and defects in the crystals were attributed to the absence of a Morin transition. Hematite is part of a complex solid solution oxyhydroxide system having various contents of water, hydroxyl groups and vacancy substitutions that affect the mineral's magnetic and crystal chemical properties. Two other end-members are referred to as protohematite and hydrohematite. 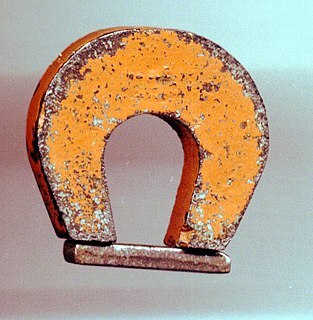 Ferromagnetism is the basic mechanism by which certain materials form permanent magnets, or are attracted to magnets. In physics, several different types of magnetism are distinguished. Ferromagnetism is the strongest type and is responsible for the common phenomena of magnetism in magnets encountered in everyday life. Substances respond weakly to magnetic fields with three other types of magnetism—paramagnetism, diamagnetism, and antiferromagnetism—but the forces are usually so weak that they can only be detected by sensitive instruments in a laboratory. An everyday example of ferromagnetism is a refrigerator magnet used to hold notes on a refrigerator door. The attraction between a magnet and ferromagnetic material is "the quality of magnetism first apparent to the ancient world, and to us today". Limonite is an iron ore consisting of a mixture of hydrated iron(III) oxide-hydroxides in varying composition. The generic formula is frequently written as FeO(OH)·nH2O, although this is not entirely accurate as the ratio of oxide to hydroxide can vary quite widely. Limonite is one of the three principal iron ores, the others being hematite and magnetite, and has been mined for the production of iron since at least 2500 BCE. In materials that exhibit antiferromagnetism, the magnetic moments of atoms or molecules, usually related to the spins of electrons, align in a regular pattern with neighboring spins pointing in opposite directions. This is, like ferromagnetism and ferrimagnetism, a manifestation of ordered magnetism. Meridiani Planum is a plain located 2 degrees south of Mars's equator, in the westernmost portion of Terra Meridiani. It hosts a rare occurrence of gray crystalline hematite. On Earth, hematite is often formed in hot springs or in standing pools of water; therefore, many scientists believe that the hematite at Meridiani Planum may be indicative of ancient hot springs or that the environment contained liquid water. The hematite is part of a layered sedimentary rock formation about 200 to 800 meters thick. Other features of Meridiani Planum include volcanic basalt and impact craters. Sinus Meridiani is an albedo feature on Mars stretching east-west just south of that planet's equator. It was named by the French astronomer Camille Flammarion in the late 1870s. Rock magnetism is the study of the magnetic properties of rocks, sediments and soils. The field arose out of the need in paleomagnetism to understand how rocks record the Earth's magnetic field. This remanence is carried by minerals, particularly certain strongly magnetic minerals like magnetite. An understanding of remanence helps paleomagnetists to develop methods for measuring the ancient magnetic field and correct for effects like sediment compaction and metamorphism. Rock magnetic methods are used to get a more detailed picture of the source of distinctive striped pattern in marine magnetic anomalies that provides important information on plate tectonics. They are also used to interpret terrestrial magnetic anomalies in magnetic surveys as well as the strong crustal magnetism on Mars. 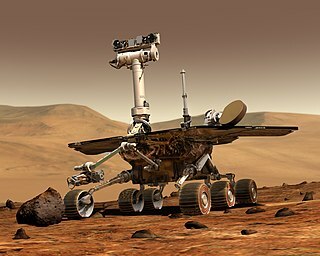 NASA's 2003 Mars Exploration Rover Mission has amassed an enormous amount of scientific information related to the Martian geology and atmosphere, as well as providing some astronomical observations from Mars. This article covers information gathered by the Opportunity rover during the initial phase of its mission. Information on science gathered by Spirit can be found mostly in the Spirit rover article. Aram Chaos, centered at 2.6°N, 21.5°W, is a heavily eroded impact crater on the planet Mars. It lies at the eastern end of the large canyon Valles Marineris and close to Ares Vallis. Various geological processes have reduced it to a circular area of chaotic terrain. Aram Chaos takes its name from Aram, one of the classical albedo features observed by Giovanni Schiaparelli, who named it after the Biblical land of Aram. Spectroscopic observation from orbit indicates the presence of the mineral hematite, likely a signature of a once aqueous environment. The Morin transition (also known as a spin-flop transition) is a magnetic phase transition in α-Fe2O3 hematite where the antiferromagnetic ordering is reorganized from being aligned perpendicular to the c-axis to be aligned parallel to the c-axis below TM. The surface of the planet Mars appears reddish from a distance because of rusty dust suspended in the atmosphere. From closeup, it looks more of a butterscotch, and other common surface colors include golden, brown, tan, and greenish, depending on minerals. An orthoferrite is any of a class of chemical compounds with the formula RFeO3, where R is one or more rare-earth elements. Orthoferrites have an orthorhombic crystal structure with a space group Pbnm and most are weakly ferromagnetic. At the Néel temperature TN the subsystem of iron ions orders into a slightly canted antiferromagnetic structure with antiferromagnetic moment G and a weak ferromagnetic moment F. The rare-earth ion subsystem acquires magnetization m due to an interaction with the iron subsystem. The orthoferrites are particularly interesting because of the presence of an antisymmetric exchange interaction which involves the vector cross product of neighboring spins as opposed to the usual scalar product. In the absence of this interaction, the orthoferrites would be antiferromagnetic. Its presence leads to a small canting of the sublattices, making the orthoferrites “weak” ferromagnets with 4πMs = 100 G. Another interesting feature of these materials is the fact that some of them exhibit a transition as a function of temperature, in which the direction of the antiferromagnetically ordered spins and consequently also of the net magnetization rotates by 90°. The composition of Mars covers the branch of the geology of Mars that describes the make-up of the planet Mars. ↑ Dunlop, David J.; Özdemir, Özden (2001). Rock Magnetism: Fundamentals and Frontiers. Cambridge: Cambridge University Press. p. 73. ISBN 9780521000987. ↑ Anthony, John W.; Bideaux, Richard A.; Bladh, Kenneth W.; Nichols, Monte C. (eds.). "Hematite" (PDF). Handbook of Mineralogy. III (Halides, Hydroxides, Oxides). Chantilly, VA, US: Mineralogical Society of America. ISBN 978-0962209727 . Retrieved December 22, 2018. ↑ "Hematite Mineral Data". WebMineral.com. Retrieved December 22, 2018. ↑ "Hematite". Mindat.org. Retrieved December 22, 2018. 1 2 Cornell, Rochelle M.; Schwertmann, Udo (1996). The Iron Oxides. Germany: Wiley. pp. 4, 26. ISBN 9783527285761. LCCN 96031931 . Retrieved December 22, 2018. 1 2 "Ochre". Industrial Minerals. Minerals Zone. Archived from the original on November 15, 2016. Retrieved December 22, 2018. ↑ "Researchers find earliest evidence for modern human behavior in South Africa" (Press release). AAAS. ASU News. October 17, 2007. Retrieved December 22, 2018. ↑ Levato, Chiara (2016). "Iron Oxides Prehistoric Mines: A European Overview" (PDF). Anthropologica et Præhistorica. 126: 9–23. Retrieved December 22, 2018. ↑ Dzyaloshinsky, I.E. (1958). "A thermodynamic theory of "weak" ferromagnetism of antiferromagnetics". Journal of Physics and Chemistry of Solids. 4 (4): 241–255. Bibcode:1958JPCS....4..241D. doi:10.1016/0022-3697(58)90076-3. ↑ Moriya, Tôru (1960). "Anisotropic Superexchange Interaction and Weak Ferromagnetism". Physical Reviews Journal. 120 (1): 91. Bibcode:1960PhRv..120...91M. doi:10.1103/PhysRev.120.91. ↑ Dang, M.-Z. ; Rancourt, D.G. 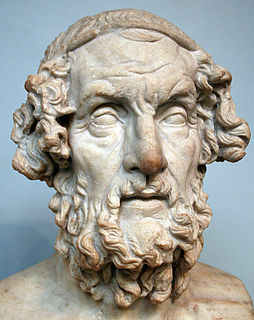 ; Dutrizac, J.E. ; Lamarche, G.; Provencher, R. (1998). "Interplay of surface conditions, particle size, stoichiometry, cell parameters, and magnetism in synthetic hematite-like materials". Hyperfine Interactions. 117 (1–4): 271–319. Bibcode:1998HyInt.117..271D. doi:10.1023/A:1012655729417. ↑ Vallina, B.; Rodriguez-Blanco, J.D. ; Brown, A.P. ; Benning, L.G. ; Blanco, J.A. (2014). "Enhanced magnetic coercivity of α-Fe2O3 obtained from carbonated 2-line ferrihydrite". Journal of Nanoparticle Research. 16 (3): 2322. Bibcode:2014JNR....16.2322V. doi:10.1007/s11051-014-2322-5. ↑ Redman, Chris (May 20, 2009). "The next iron rush". Money.cnn.com. Retrieved December 22, 2018. ↑ "Sveriges mest beprövade husfärg" [Sweden's most proven house color] (in Northern Sami). Retrieved December 22, 2018. ↑ "Mars Global Surveyor TES Instrument Identification of Hematite on Mars" (Press release). NASA. May 27, 1998. Archived from the original on May 13, 2007. Retrieved December 22, 2018. ↑ Bandfield, Joshua L. (2002). "Global mineral distributions on Mars" (PDF). Journal of Geophysical Research. 107 (E6): E65042. Bibcode:2002JGRE..107.5042B. doi:10.1029/2001JE001510. ↑ Glotch, Timothy D.; Christensen, Philip R. (2005). "Geologic and mineralogic mapping of Aram Chaos: Evidence for a water-rich history". Journal of Geophysical Research. 110 (E9): E09006. Bibcode:2005JGRE..110.9006G. doi:10.1029/2004JE002389. ↑ Glotch, Timothy D.; Rogers, D.; Christensen, Philip R. (2005). "A Newly Discovered Hematite-Rich Unit in Aureum Chaos: Comparison of Hematite and Associated Units With Those in Aram Chaos" (PDF). Lunar and Planetary Science XXXVI: 2159. Bibcode:2005LPI....36.2159G. ↑ "Hematite". NASA. Retrieved December 22, 2018. ↑ "Black Gemstones, Diamonds and Opals: The Popular New Jewelry Trend". TrueFacet.com. October 23, 2015. Retrieved December 22, 2018. ↑ "(What's the Story) Mourning Jewelry?" . Retrieved December 22, 2018. ↑ "Magnetic Hematite". Mindat.org. Retrieved December 22, 2018. 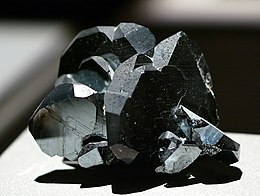 Wikimedia Commons has media related to Hematite .